There’s so much I love about the approach and all of the authors in here but damn, are they white, male and privileged. I think Rebecca Solnit is the only woman to grace these pages, apart from the prostitutes and the beautiful women the surrealists stalked through the city… The one Situationist who did seem to actually try to practice psychogeography and write about it was forced to desist after several prison stays–apparently the police didn’t appreciate a Black Algerian immigrant name of Abdelhafid Khatib experiencing aimlessly in public spaces, especially after immigrant curfew time. What the hell were his comrades doing about that? I’d like to know. 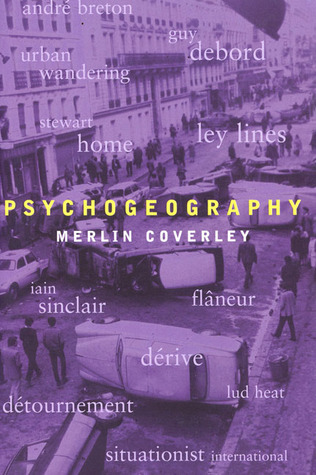 The word psychogeography, suggested by an illiterate Kabyle as a general term for the phenomena a few of us were investigating around the summer of 1953, is not too inappropriate. It does not contradict the materialist perspective of the conditioning of life and thought by objective nature. Geography, for example, deals with the determinant action of general natural forces, such as soil composition or climatic conditions, on the economic structures of a society, and thus on the corresponding conception that such a society can have of the world. Psychogeography could set for itself the study of the precise laws and specific effects of the geographical environment, consciously organized or not, on the emotions and behavior of individuals. The adjective psychogeographical, retaining a rather pleasing vagueness, can thus be applied to the findings arrived at by this type of investigation, to their influence on human feelings, and even more generally to any situation or conduct that seems to reflect the same spirit of discovery. Taken up with the situationists, there is no mention of Lefebvre where I thought there would be. They define psychogeography as ‘The study of the specific effects of the geographical environment, conspicuously organised or not, on the emotions and behaviour of individuals. The invented the derive: A mode of experimental behaviour linked to the conditions of urban society: a technique of transient passage through varied ambiences. Also used to designate a specific period of continuous deriving’  And the detournement: The integration of present or past artistic production into a superior construction of a milieu. Here the theoretical grounding, carried on by Vaneigem and de Certeau. And the final chapter on rehashing some of the awesomeness being produced about London. And it is awesome. But still, so white, so male, and what is a movement if it is only produced in two cities? Surely it must lie beyond, surely there are walkers and writers around the globe. I have a lot of questions, but for my first foray into what psychogeography actually is after hearing the term kicked about, this is quite all right.